A black and white standalone banjo with a modern look, the Midnight Special is the top of the Goodtime line. It has a special new Deering Tone Ring mounted on a violin grade maple 3-ply rim for a sound that is absolutely amazing in an affordable banjo. This modern black and white banjo has a look that is striking and classic at the same time. It's a modern banjo players banjo with great performance at an affordable price and is American made. Neck Width at the nut: 1-1/4? Scale length nut to bridge: 26-1/4? Deering banjos with the lifetime warranty are only available through authorized Deering Dealers. IF YOU BUY A "NEW" DEERING BANJO FROM A NON-AUTHORIZED DEALER, YOU HAVE PURCHASED A USED BANJO AND HAVE NO WARRANTY. When we send a Deering banjo to an authorized dealer, only that dealer or another authorized dealer can sell that banjo as new. If an authorized dealer sells a new Deering banjo to a non-authorized dealer, the non authorized dealer becomes the first owner and he becomes the bearer of the lifetime warranty; not a new dealer by transfer. When the unauthorized dealer sells that banjo to the consumer, even if it was never played or even touched, it is a used instrument and no longer carries the lifetime warranty. This is necessary so that we know how the banjo has been cared for between the time we ship it and the time that our customers buy it. We have no way of knowing how non-authorized dealers care for their instruments because we do not communicate with them. This also honors and protects the strong relationship between Deering and its treasured network of hard working Deering dealers. 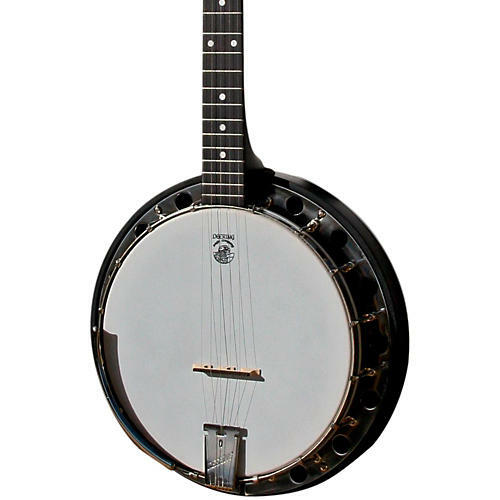 For your protection against theft and to ensure immediate proof of ownership, four digits of the serial number are visible on the back of the peghead on each banjo. The full serial number is inside the resonator. When you purchase a Deering banjo and send in the warranty card you will receive a Gold Credit card style ownership/warranty card. This gold card is embossed with your name and the serial number of your new banjo for easy identification. Take your Gold Card with you to festivals or when traveling so that if your banjo is ever stolen you can easily prove it's yours.